Accounts Receivable: No payment will be taken in All Orders. All payment will be received in Quickbooks after the order has shipped and been invoiced. Full Payment On Shipping:Orders can be filled and quantities allocated but cannot be shipped until full payment is taken. Partial Payment On Order, Full Payment On Shipping: A payment must be taken on the order for part of the total amount before it can be filled or creating linked transactions. Payment must be made in full before the items can be shipped. Manual Payment Entry:There are no rules for how much of the order has to be paid for but the ability to collect payments will be enabled for orders with this term. All Orders will use the payment methods to determine if the payment is cash / check or credit card. All Orders will auto-fill the terms and payment method from the customer record. All Orders also provides a internal control to prevent a particular user from overriding a customers terms. To accomplish this UN-CHECK 'this user can edit the default customer values...' in manage users. Now when you create a sales order you will notice a payment icon on the bottom right of the screen. Click payment icon to enter the customer's payment information. The default payment amount is the entire order amount so you will need to edit that value. If a credit card payment method is selected you will be able to fill in the relevant credit card information. If you have set up credit card processing you will be able to process the card as well. See the article on Processing Credit Cards for more information on this. You can also select whether you want to push the payment to QuickBooks when you save the sales order. When you do this, the customer's accounts receivable balance will be become negative. Although this may seem counter-intuitive, from an accounting point of view it is correct. The negative A/R balance represents a liability until such time as the order is filled. If you send payments to QuickBooks at the sales order level, it is suggested that you UN-CHECK the automatically apply payment preference so that the payment can be applied to the correct invoice within QuickBooks. 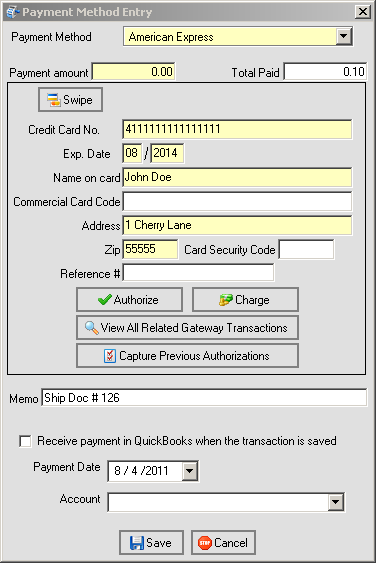 After completing the payment information, click 'Save' to return back to the sales order and Save again to commit the transaction to the database. You will notice the balance reflects what the custom owes upon shipment. When you Fill the sales order as usual you will be presented with a Ship Doc which also has the payment icon. Click the icon and enter the balance. Click Invoice to record both the invoice and the payment within QuickBooks.